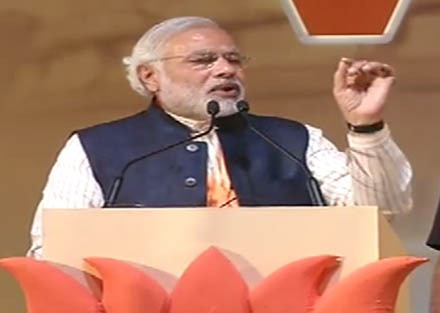 18th February, 2014 : Narendra Modi addressed the Bharatha Gellisi rallies at Davangere and Mangalore in Karnataka. Addressing the rally Shri Narendra Modi spoke on the key aspects of ensuring a Congress-Mukt Bharat, getting rid of corruption, ensuring prosperity of farmers and focusing on the development of coastal regions. Addressing a large rally in Mangalore, Shri Modi highlighted a comprehensive vision for the development of India. He talked about the rich potential of coastal areas to emerge as development hubs. Shri Modi affirmed that in addition to port development, what is required is port led development. He also called for creating fishing harbours and called for integrating latest technology for the betterment of the fishermen community. In Mangalore Shri Modi took on the Congress Party for their anti-people policies and their lies. He said, “Congress has ruined the nation and cannot tolerate if anyone asks them any questions. When someone asks them questions they are jailed. Congress also misuses institutions.” He further attacked the Congress for their corruption and false promises.